Real Madrid’s Cristiano Ronaldo was absent from full training on Wednesday, raising fears that he would miss this weekend’s El Clasico. 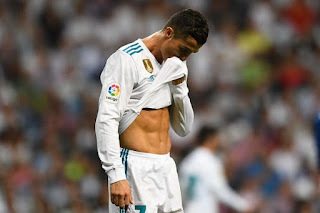 Real confirmed Ronaldo had “worked separately from the group”, amid reports he suffered a calf injury in the Club World Cup final win over Gremio. The Portugal captain netted the winner in the game and was expected to feature in the high-profile clash at the Santiago Bernabeu. Madrid are 11 points behind the Camp Nou club, who have not lost in La Liga this season. Zinedine Zidane’s side took the honours when the teams met in the Supercopa, with Ronaldo scoring in the 3-1 first-leg win before being sent off.